James David Wolfensohn, KBE, AO (born 1 December 1933) is an Australian-American lawyer, investment banker and economist who served as the ninth president of the World Bank Group. Wolfensohn was born in Sydney, New South Wales, Australia, on 1 December 1933. In his autobiography, A Global Life, he described how monetary insecurity was a fact of life from childhood and explained that he was always looking for a cushion to protect himself from it. He attended Woollahra Public School, and then Sydney Boys High School. He studied arts (BA) and law (LLB) at the University of Sydney. In 1959 he earned a Master of Business Administration (MBA) from Harvard Business School. In his 2010 memoirs he reveals that he failed several university classes, including English, and was a "late developer". He was a member of the Australian fencing team at the 1956 Summer Olympics in Melbourne and an officer in the Royal Australian Air Force. Before attending Harvard, Wolfensohn was a lawyer in the Australian law firm of Allen, Allen & Hemsley in Sydney (now Allens Arthur Robinson). Upon graduating from Harvard Business School, Wolfensohn worked briefly for Swiss cement giant Holderbank (now Holcim). He returned to Australia, where he worked for various banking institutions, including Darling & Co. In the late 1960s, he became a director of Darling's major shareholder J. Henry Schroder & Co, a London-based investment bank. He was a senior executive in the London office before becoming managing director of the bank's New York City office from 1970-76. He later became a senior executive at Salomon Brothers. In 1979, together with Chrysler Corporation's then chief executive officer Lee Iacocca and then President of the New York Fed Paul A. Volcker, who later became Chairman of the Board of Governors of the Federal Reserve System, Wolfensohn helped orchestrate the rescue of Chrysler from the verge of bankruptcy. In 1980, he became a naturalized citizen of the United States, after it was rumored that he was a candidate to succeed Robert McNamara as president of the World Bank. After he was unsuccessful in this pursuit, he established his own investment firm, James D. Wolfensohn, Inc., along with partners including Paul Volcker. Upon accepting his nomination to serve as president of the World Bank in 1995, Wolfensohn divested of his ownership interest in James D. Wolfensohn, Inc. The firm was later bought by Bankers Trust. In 2005, upon stepping down as president of the World Bank, he founded Wolfensohn & Company, LLC, a privately held firm that invests, and provides strategic consulting advice to governments and large corporations doing business, in emerging market economies. Since 2006, Wolfensohn has also been the chairman of the International Advisory Board of Citigroup. In 2009, he became a member of the International Advisory Council of the Chinese sovereign wealth fund China Investment Corporation. Wolfensohn (left) with U.S. President George W. Bush in the Oval Office, 2005. Wolfensohn speaking at a press conference with Condoleezza Rice in 2006. Wolfensohn became president of the World Bank on 1 July 1995 after he was nominated by U.S. President Bill Clinton. He was unanimously supported by the bank's board of executive directors to a second five-year term in 2000, becoming the third person to serve two terms in the position after Eugene R. Black and Robert McNamara. He visited more than 120 countries around the world during his term as president. He is credited, among other things, with being the first World Bank president to bring attention to the problem of corruption in the area of development financing. In April 2005, Wolfensohn was appointed special envoy for Gaza disengagement by the Quartet on the Middle East, a group of major powers and the United Nations promoting the Israeli-Palestinian peace process. He resigned after 11 months as special envoy when he understood the United States government to be undermining his efforts and firing his staff. In 2006, Wolfensohn founded the Wolfensohn Center for Development at the Brookings Institution, a Washington, D.C.-based think tank. The center examined how to implement, scale up, and sustain development interventions to solve key development challenges at a national, regional, and global level and strives to bridge the gap between development theorists and practitioners. Its projects focused on youth exclusion in the Middle East, large-scale anti-poverty programs, reforms of global economic governance, and regional cooperation, particularly in Central Asia. The Center concluded work after five years. 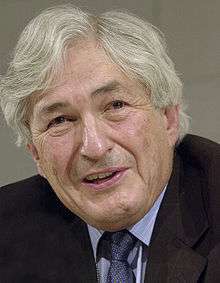 Wolfensohn is an honorary trustee of the Brookings Institution, and served as a trustee of the Rockefeller Foundation. He is a trustee and the former chairman of the board of trustees of the Institute for Advanced Study in Princeton. He is chairman emeritus of Carnegie Hall in New York and of the John F. Kennedy Center for the Performing Arts in Washington, D.C., and a member of the Council on Foreign Relations. He serves on the board of various charitable foundations, including the Wolfensohn Family Foundation. In July 2008, Wolfensohn was selected as one of the inaugural fellows of the Australian Institute of International Affairs. Between 1985 and 2015 Wolfensohn has attended 27 conferences of the Bilderberg Group, making him one of the most frequent participants in this time period. He also attended meetings of the Aspen Institute and the World Economic Forum. He is a former member of the Steering Committee of the Bilderberg Group. In 2004, Wolfensohn was the commencement speaker at Brandeis University. Wolfensohn sits on the board of Endeavor (non-profit). He is a member of the Honorary Board of the International Paralympic Committee. Wolfensohn, a friend of Jacqueline du Pré, began cello studies with her at the age of 41 when she offered to teach him on the condition that he perform on his 50th birthday at Carnegie Hall in New York City, which he did. He repeated the exercise on his 60th and 70th birthdays with Yo-Yo Ma and Bono. He continues to play and has appeared, together with musician friends, at private events at Carnegie Hall and elsewhere. He has received numerous awards throughout his life, including becoming an honorary officer of the Order of Australia in 1987, and an honorary knighthood of the Order of the British Empire in 1995 for his service to the arts. The University of New South Wales conferred an honorary degree of Doctor of Science in 2006 and received the Award of Excellence from The International Center in New York. He is a member of both the American Academy of Arts & Sciences  and the American Philosophical Society. He is married to the former Elaine Botwinick, and has three children and seven grandchildren. In October 2010, Wolfensohn regained his Australian citizenship. In New York, he found himself at a Jerusalem Foundation lunch next to Dorothy de Rothschild, widow of James. She could not tell him why his father suddenly had left Rothschild six decades earlier. But he was reassured that his father had been a "wonderful man". In 2006, Wolfensohn received the Leo Baeck Medal for his humanitarian work promoting tolerance and social justice. In 2011, Wolfensohn was awarded the Golden Biatec Award, the highest award bestowed by Slovakia's Informal Economic Forum - Economic Club, for his contribution to addressing global priorities. Sebastian Mallaby (2004) The World's Banker. Critical biography by former Economist writer and Washington Post contributor, emphasis on World Bank; ISBN 1-59420-023-8. James D. Wolfensohn and Andrew Kircher (2005) Voice for the World's Poor: Selected Speeches and Writings of World Bank President James D. Wolfensohn, 1995–2005; ISBN 978-0-8213-6156-6. Collection of speeches, articles, memoranda and op-eds. ↑ "James Wolfensohn Olympic Results". sports-reference.com. Retrieved 13 October 2010. ↑ Joseph B. Treaster (2004). "Paul Volcker: The Making of a Financial Legend." Chapter 10: Fly-Fishing. John Wiley & Sons; ISBN 0-471-42812-4. 1 2 Profile, citigroup.com; accessed 1 April 2014. ↑ China Investment Corporation website; accessed 1 April 2014. ↑ James D. Wolfensohn, Annual Meeting Address, 1 October 1996, World Bank website; retrieved 4 July 2014. ↑ NNDb profile; retrieved 21 May 2006. ↑ Grassroots Business Fund: Governing Board and Advisors; retrieved 1 April 2014. ↑ "Gift to Help Create Center on Poverty", nytimes.com; 16 May 2005; retrieved 16 March 2007. ↑ Wolfensohn Center for Development, Brookings Institution website; retrieved 26 May 2012. ↑ "Former Steering Committee Members". bilderbergmeetings.org. Bilderberg Group. Retrieved 8 February 2014. ↑ WOLFENSOHN, James David profile, itsanhonour.gov.au; retrieved 11 February 2008. ↑ "American Academy of Arts & Sciences" (PDF). ↑ Golden Biatec Award awarded to Wolfensohn, hospodarskyklub.sk; accessed 1 April 2014. Wikimedia Commons has media related to James Wolfensohn. "Iraq’s debts needed to be reduced by 33%, from roughly $120 billion to $80 billion in order to fund reconstruction needs and long-term economic development."